Last weekend Vitantonio Liuzzi gave some of the other Formula 1 drivers a demonstration of why it is that some people in F1 think he is a star, who is being wasted in his current role at Red Bull Racing. Competing in Juan Pablo Montoya's Carrera de Estrellas on a street circuit in Cartagena, Colombia, Liuzzi set the fastest lap in the first of the two races and then won the second at a canter. The problem was that he retired from the first race and so did not figure in the overall results, victory going to McLaren test driver Pedro de la Rosa. It remains to be seen whether this will have any effect at all on the decision making at Red Bull Racing this winter where a decision must be made about who will partner David Coulthard next season. This year Liuzzi and Klien were supposed to share the drive but it was obvious from very early on that this was not a good idea. "My biggest problem this year was my team mate Tonio Liuzzi," says Klien. "We had to share the car and all the testing and that went on until mid-season. You were never sure if you were going to be getting the next race and that made it very difficult to be mentally prepared. It was the same for him, probably it was a bigger problem for him because I was the one who ended up with the drive for more of the time." "What we were able to show this year was about 60% of what might have been possible if things had been different," he says. "You cannot show much in just four races and in Friday practice you cannot really show anything at all. You just have to follow the programme that is best for the team, choosing the tyres and so on. So you are not showing what you can do in terms of outright lap times and no-one really knows what you have been doing. It just depends on what the team wants to test. In the four races that I did do, apart from Barcelona where we struggled a lot, we had strong performances. But you cannot judge the career of a driver by what happens in only four races. "I did not get enough races. It is difficult to see it when you are looking in from the outside but F1 is not an easy job. You have to have experience in the car. You cannot buy that. I am pretty happy about the first four races that I did but I think there is a lot more to come in the future. This year was not as outstanding as it could have been but if you look at the first years of Kimi Raikkonen and Fernando Alonso they were not really anything special either. You have to be in the right situation with the right machinery." Klien too says that he could have shown better. "My season was divided into two very distinct parts," he says. "The first part was maybe 80% because I was in the situation where I was switching cars all the time. I had to share everything with Tonio. We did half the testing each and when it was his turn to race alongside David Coulthard that was really tough for me. When I came back for the second half of the season, I got most of the races and I think I was probably working at about 90-95%. I was really strong in the last few races. I did very good qualifying in Brazil, in Suzuka and in Shanghai. I was very happy with that. The more experience you have the better you are and the better the job you can do." Klien says his biggest disappointment was at Imola when he had to stand down for Liuzzi. 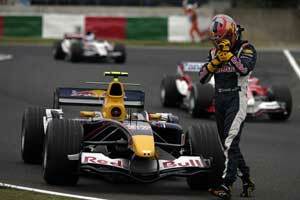 "It was very difficult to step back and watch for the next four races. I came back in Canada and I scored a point which was good." "The biggest disappointment for me was the decision not to let me race any more," says Liuzzi. "At the beginning we had an agreement that Christian and I were going to divide the season in half and share the car. Then, for marketing reasons or whatever, they preferred to let Christian run. Then they thought it was the best thing for the World Championship to go on doing that because they thought that changing us around all the time would be difficult for us and it would not be the best way to get the maximum number of points." "When you go racing and you have to give your seat to another driver you don't get the kilometres in testing. You lose the rhythm. I got less miles in testing as well and it is very difficult to get into it. Formula 1 is all about feeling, kilometres and experience. Now I am more comfortable than I was at the beginning because I have more kilometres in the car. When you have that confidence in the car, when you feel yourself one with the car, things are much easier. At the start I did not have that because I did not drive that much." Both drivers say that they are aiming for the seat alongside Coulthard next year. "I think I have quite a good chance to do that," said Klien. "You know everyone thought that Tonio would get the last few races but in the end I was the one who was chosen and I did everything I could be get the best results and I hope that I can race next year. I see a big future with the team with Ferrari engines. I think we can race in the top five teams next year." "If I stay in this team there is a really good chance to score a lot of points with the new chassis and Ferrari engines," he says. "And maybe we can be more ready than other teams, like we were this year, and we could get something out of that. The team has the right mentality to score results but at the moment things are unclear. Everyone is talking about me being at Minardi and how good that would be to have an Italian in an Italian team and all that marketing but it is not decided. They have to look at the team and see what is best for the team and what is best for my career. I am still looking for a drive with Red Bull Racing and I think we can score points and get podiums."